Editorials about academia are quick to point out the startling gaps between earning a PhD and becoming a professor. 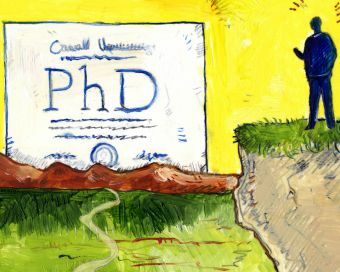 Justin and Megan recently wrote about pragmatic ways current PhD students might respond to this roadblock, and it certainly is an alarming issue. Based on letters in major journals though, one is left with the impression that graduate school is peopled entirely by those who do or will have a PhD after their names. Which leaves me waving my arms and asking- what about the MS students?! Master’s students are virtually invisible in treatises on graduate school. Authors bemoan the fact that PhD students are taking their huge brains off to Industry, while completely ignoring those of us who only brought our brains to academia to eventually leave it. Considering the climate of graduate education, it’s an understandable omission. MS students are not welcome at some universities, where departments would prefer to invest in students who will be in their labs for longer than 2-3 years. Where MS students are enrolled, they may be seen as intellectually inferior, lacking the ability or motivation to get a PhD or too easily wooed by the cushy life beyond the Ivory Tower. Even if professors are open to accepting MS students, they may find short-term funding logistically difficult, and prospective students may have trouble securing their own funding for the same reason. With fewer MS students and a potential bias against the ones who do exist, it’s no wonder that MS students are bit players in academic dialogue, and perhaps that’s contributing to such a pessimistic conversation. If drawn to scale, this figure depicts a man crash-landing at the bottom of a cliff if he decides to pursue an MS rather than PhD. Coincidence? Image from http://chronicle.com/article/What-I-Learned-About-Surviving/131247/. MS students have a much more significant role in academia than is currently attributed to them, and I’d argue that acknowledging that would go a long way to bolstering spirits in the sciences. It would be easy for me to suggest that increased funding for MS students would fix the problem, but I can hardly toss around financial advice in the post-recession era, and I honestly don’t think that money is the root cause. Besides, the average academic can’t influence federal budgets, but everyone in a university can have an opinion about the value of those involved in science. The cumulative impact of those opinions has been evident in my UNC grad student experience. As an MS student, I have felt consistently valued by my lab and department, which holds us to high standards. When MS students are treated similarly to their doctoral counterparts, they can conduct robust research and develop strong skills, albeit with an eye for a different career goal. The allure of professorship may be partially due to the undervaluing of “alternative” science careers- many of which are undertaken by MS students. Scientific research is held in high esteem by the academic community partially because it is expected to benefit society. Why then aren’t more graduate students encouraged to use their education to make that link? Former grad students are perfectly poised to apply their background in the scientific method, and all the critical thinking and ingenuity fostered by it, to complex environmental problems. They can dig into the literature, ask contrary questions, accept input (or extensive editing!) from other authorities, and make systematic observations that will enable them to identify viable solutions. Alaina G. Levine has a great article in the American Geophysical Union’s Career Center in which she labels such activity “scientific-problem solving”, to distinguish it from “doing” science in the more traditional sense. If there’s anything the world needs more of right now, isn’t it scientific problem solvers? Employees of consulting firms and management agencies are making decisions that can have profound ramifications, and if anything, academics should be conspiring to infiltrate those sectors with former grad students. This could certainly include PhDs, but an MS is the traveling degree for many of these positions. There’s a lot to be gained by viewing the MS degree as valuable in itself, rather than a cop-out leading to a second-rate career in “science”. Could this environmental scientist “only” have her MS? Quite possibly! Image from http://esgp.osu.edu/. Levine’s article quotes managers who comment that an MS is the ideal degree for scientific-problem solving jobs; it connotes authority without being overly specialized. The need for non-academic scientists is echoed by the USBLS’s Occupational Outlook Handbook, which expects demand for environmental scientists to increase by 15% through 2022- “faster than average”. Given the decent job market and need for their skills, MS students stand to conduct impactful work, and it’s incredible that these students are at best ignored by academics in press. I firmly believe that environmental policy in the US would benefit from the participation of more scientific-problem solvers who come from an academic background. Perhaps if MS students were more broadly acknowledged in academic conversation, and if the degree and its applications were viewed as valuable end goals, more students would enter grad school aiming for an MS rather than PhD. In that way, we might address multiple problems at once: clearing the path for would-be professors, brightening the tenor of dialogue about academia, and sending well-informed grad students off to tackle environmental challenges. Tags: academia, graduate school, MS, PhD, science careers. Bookmark the permalink.